On release from prison Rikki sets out to discover the fate of his girlfriend Hanna. He goes to the farm where she grew up; he meets with her brother Oscar and parents. Hanna had died two years previously. Rikki knows this. What he does not know is where she had hidden the drugs and the jewelry, stolen goods he and Hanna had stolen from Hanna’s earlier fiancé Anton, a ruthless drug dealer. Anton had even beaten Hanna to within an inch of her life in an attempt to force her to reveal its hiding place. The goods he and Hanna had wanted to sell for lots of money so they could escape their shabby life in Reykjavik. Rikki befriends Oscar, a mentally challenged young man. Perhaps he knows something … While searching for the truth about Hanna’s last days, Rikki and Oscar find another well-hidden secret – a family tragedy that Oscar is finding extremely hard to deal with. 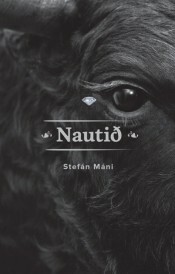 The author: Stefán Máni was born and raised in a small fishing village in Iceland. He dropped out of school at seventeen and worked for twenty years in the fishing industry and as a construction worker. After losing his job he started to write. In 2006 The Ship became an international bestseller and was translated into nine languages. He has published more than fifteen novels that all share the harsh, cold, loneliness of Icelandic nature that mirrors the people populating his novels. The stories often take place in the grey area between good and evil, full of suspense and adventure. Although firmly set in the real world his stories also give a feeling of magic realism through their connection to Icelandic sagas and folklore.